Dog crates can be very helpful, especially for house training your Labrador. It is best to begin placing them in their crate when they are still puppies. For such an early stage, they will feel at ease and comfortable every time they stay inside. Also, they will be well protected from the noisy and busy environment and at the same time, your home will be safe from their vigorous jumping and romping. In addition, it is more convenient to use them when travelling with your Lab. You can be assured that they are safe and sound. There are two kinds of dog crates – wire and plastic. Wire crates allow you to see your Lab easily. Cleaning them is trouble-free for having a quality solid floor pan that can be removed and returned without hassle. They have the advantage of being easy to store and carry because you can fold them flat and easily carry them. Wire crates also have more ventilation, a plus in hot climates. Aside from that, they can provide your pet the proper and appropriate ventilation that they need. Labs crates are usually sized either 19 x 24 inches or 24 x 36 inches. If buying the crate for your home, go for the larger size. If used in a car, the smaller size might work better. This adjustable wire dog crate has an adjustable inside panel to change the crate size as your dog grows. The second type is the plastic variety. These units are easy to assemble and convenient to use. They have fewer openings, which may give your pet more time alone to enjoy his comfort and privacy inside. They can also give your Lab proper insulation especially during winter and wet seasons. Some of them have great features that allow you to remove the top part and use the bottom part as your pet’s bed. They are great to use when traveling because they are light to carry and are the only kind of dog crate that are airline-approved. Given all the features of the two types decide carefully on which of the two is more advantageous. Depending on your preference, you can pick the crate that is best for your Lab. Choosing the right size of unit depends on how big your Lab is. Be certain that the crate is neither too small nor too large for them. You never want them to feel restricted when they move. An over-sized one is not advantageous either especially when you plan to use the crate to house train your pet. They are supposed to be the dog’s comfort zone or retreat so they must be comfortable and cosy to stay in and be happy in the crate. There are some dog crates that allow you to adjust the size as your dog grows. They come with divider panels that you can place or remove according to your pet’s size. However, these divider panels are only available in wire crates. So when using a plastic crate, it is best to purchase a larger one because they do not come with an adjustable feature. In picking your Labradors crate, make sure that he can lie down comfortably, move freely, and turn around without any restraint. It should be just big enough for your Lab to turn around and stand up in. Providing too much room could give your dog the impression that they could go to the bathroom in a corner, the very thing you are trying to avoid. An adult Lab will usually need a plastic crate that is sized 400 or 500. If measured in inches, look fora crate that is 19 x 24 inches or 24 x 36 inches. Crate training a dog or puppy starts as soon as you bring them home. After the first day, and just after you took your pup outdoors for housebreaking, place the puppy in the crate. Ideally you have asked the breeder for a towel or old shirt that carries the scent of the mother to make the puppy feel comfortable in the crate. 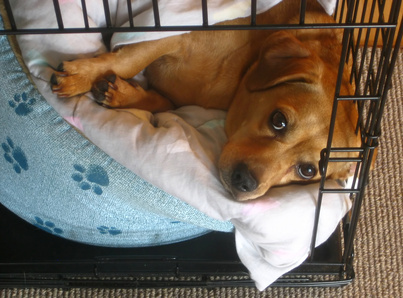 Dogs will instinctively not want to go to the bathroom in their den or home, which is the crate. In general, a Labrador Puppy will need to go to the bathroom every 1 to 3 hours. Tip: Place the crate in your bedroom. The puppy will be comforted by knowing you are not too far away. If the puppy cries, DO NOT take him out of the crate. This just teaches the puppy that crying will get you to provide comfort. The key to training is to make your intentions clear. Instead of removing the puppy, use a command that means quiet, such as "shush" or "quiet." The key to housebreaking a puppy is to establish a routine. Never have your dog in the crate for longer than four hours. Take your Labrador out of the crate at set times and bring the puppy outside to go to the bathroom. Do this right after they wake up, and after meals or play.An alarm clock could help an owner stay on schedule. Some dogs have unique behaviors or signals when they have to go. Try and learn what these signals are. Provide a command that you only use when you are instructing your dog to go to the bathroom, such as "go to bathroom." When your dog does go, provide praise. All family members should use the same commands. If a dog does not go to the bathroom after 15 minutes when outdoors, place him or her back in the crate for 1/2 hour. Then take him out of the crate, and back outdoors you go for another 15 minutes. In the morning, don't provide breakfast until after the first time going to the bathroom. When a dog is a puppy, they will usually need to go 1/2 hour to 1 hour after eating and drinking. At first, take the puppy out 10 minutes after eating just to be sure. If the pup doesn't go to the bathroom, take the pup back in for 10 minutes, and then back out again. For more information on crate training your dog download this guide.